In the hardwood floor refinishing process, we apply various colors and finish to achieve the look you desire for your hardwood floors. Most commonly, these are natural finishes with either oil-based or water-based polyurethanes. 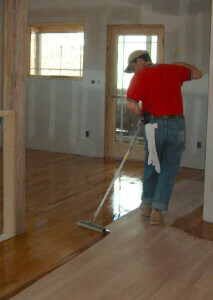 Finishing is more than just laying a coat of polyurethane on the floor. For example, staining a large hardwood floor requires a level of attention to detail and experience so you achieve uniform coloring (uniformity is important so you don’t see one area lighter or darker than another). The first step in refinishing is to make an informed selection to your finish choice. If you’re contemplating refinishing your floor yourself, keep in mind there are some things you can only know with years of hardwood flooring experience, such as maple floors don’t take stain well but it can be successfully accomplished if you know of “water-popping”. When most companies stain a floor, they only put two coats of polyurethane on top of their stain colors. By industry standards, this is acceptable because the stain is a “sealing” stain. When we refinish hardwood flooring, we choose to put three coats of polyurethane on top of the stain color because though the stain is a sealer, we see it more as color. Additionally, applying this third coat will give you greater depth and protection which will add years to the life of your floor. Whether you choose to stain or go natural with your floor, it is polyurethane (water or oil) that protects the floor. It is important to vibrate the edges and buff the floor between each coat to prepare the surface to receive a coat and to remove any incidental debris from previous coats. After the hardwood floor refinishing process is complete, the beauty of your hardwood floors are protected for years to come!